This is the rare variety with large, decorative stars (the rays have some irregular shapes rather than the common type with straight points). 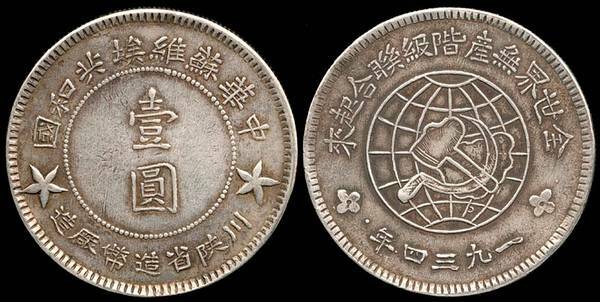 The obverse shows a globe with parts of China shown, there is a hammer & sickle superimposed. Note that Wenchou says that this is the Reverse side. In any case the characters on top mean "Unite, proletariat of the world"; the year '1934' is shown below. The KM reverse shows the value in the center as "One Yuan" circumscribed with the words "The Chinese Soviet Republic - Szechuan-Shensi". Made by the mint of this Soviet on the outskirts of Tongjiang city in Sichuan Province. It was issued by the Worker-Peasant Bank in December of 1933 and ciculated in that base-camp area. Other references for this type is Wenchou #1094 & Kann 808a. Note that there are materials in the on-line library for the Chinese Soviet Army Base Camp issues.